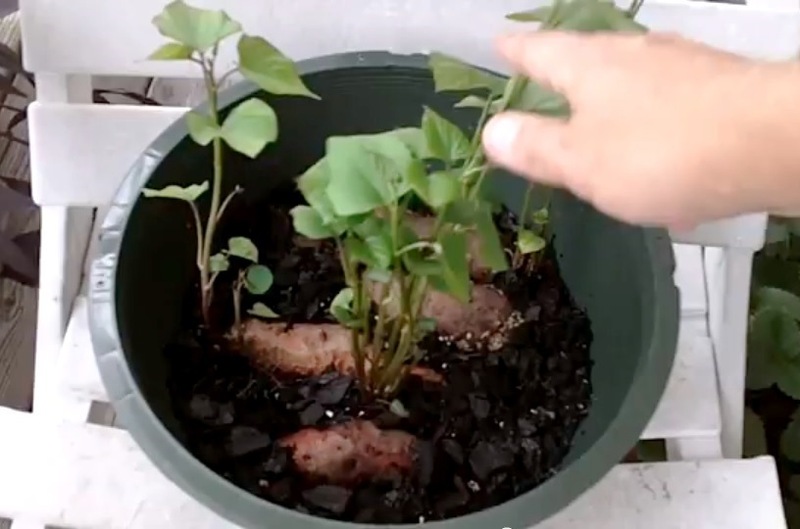 Sweet potatoes are becoming a popular food, so it’s about time I talk about how you can grow this plant yourself in a bucket. This article will give you every detail you need to get started growing your own sweet potatoes in 20 gallon buckets – from buying your first seed potato all the way to harvesting boatloads of potatoes at the end of it all. Many will argue that sweet potatoes are superior to regular potatoes. The popular paleo diet, for example, praises sweet potatoes for their high nutrition profile while decrying regular potatoes as being little more than starchy carbs. I’ve done a bit of research on the differences between sweet potatoes and regular potatoes. These are the five main points I’ve seen people talk about the most. Sweet potatoes have a similar carbohydrate content but more fiber than regular potatoes. Sweet potatoes have fewer calories than regular potatoes. Sweet potatoes have more nutrients that potatoes – most notably vitamin A and vitamin C.
Potatoes contain saponins, and sweet potatoes do not. Sometimes referred to as an “anti-nutrient,” saponins may be bad for your health if too much saponin is eaten. Sweet potatoes taste better when eaten by themselves, while regular potatoes are usually eaten with a condiment such as cheese, gravy, or ketchup. And in case you haven’t noticed – sweet potatoes can get really big. That means that you’ll actually get more yield by growing sweet potatoes in buckets than you do growing plain jane potatoes. This sweet potato idea is one of many plants you can grow using regular grocery store produce as your seed stock. I call this grocery multiplication. 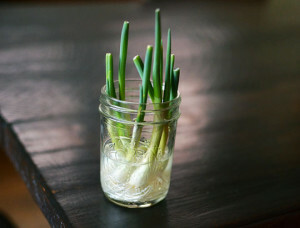 One of the best known grocery multiplication techniques is for green onions – just stick the bottom inch of a root tip in water or soil – and it will grow a fresh crop of green onions for you in a couple of weeks! Grocery multiplication works with mushrooms and Jerusalem Artichokes too! 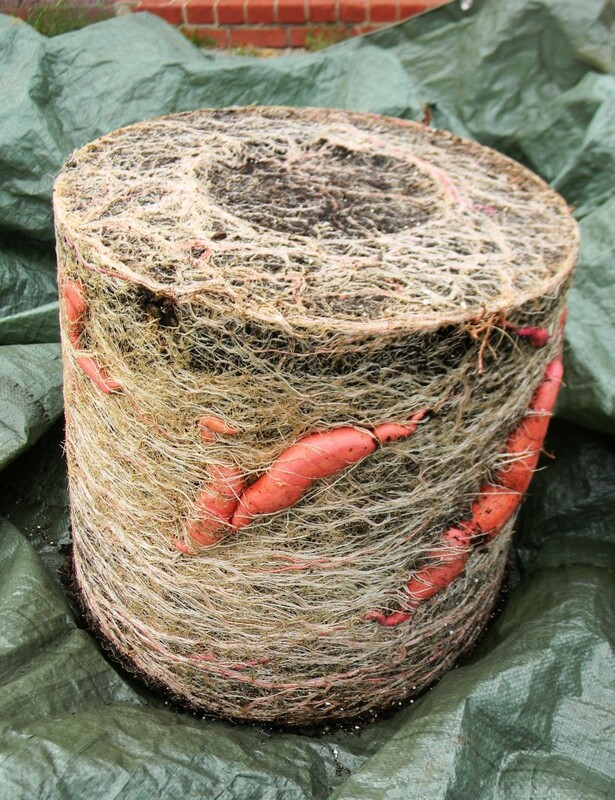 In order to multiply a sweet potato, your tubers need to be capable of producing shoots. If your sweet potato won’t grow shoots, it may because it’s been treated with a chemical during the growing or shipping process. With regular potatoes, this chemical is called BudNip and it prevents potatoes from growing shoots. They’re still edible, but since they don’t sprout you can’t grow new potatoes from them. You can ensure your sweet potato has had minimal contact with hormones or other chemical agents by selecting an organic sweet potato to use as your growing stock. Here’s a sweet potato – it happens to be the one I’m eating tonight – that is already starting to produce sprouts. In sweet potato lingo, these growths are called slips – and it’s these sprouts that we use to grow more sweet potatoes. Unlike conventional tubers like carrots and regular potatoes, sweet potatoes love the heat. To make sure your sweet potato lasts long enough to sprout, never store them below a temperature of 50°F (10°C) or they will quickly rot and turn into mush. Make sure your sweet potatoes are stored at room temperature. I’ve also noticed that sweet potatoes kept in a plastic bag rot quicker. So remember – keep them warm and let them breathe. In fact, sweet potatoes kept in cold storage at any point may never sprout, so make sure your grocery store isn’t storing them cold either. Heat is even more important to a sweet potato at harvest time. We’ll get into that more closer to the end of this article. The first order of business with growing sweet potatoes is getting a nice crop of sweet potato slips. Place your single seed potato in a 5 gallon bucket of moist soil, tops exposed. This is your “slip nursery” – an intermediate step between your grocery store shelves and your garden plot. As with anything planted in buckets, make sure to drill adequate drainage holes in the bottom. Before long, your “slips” will start rocketing out of your sweet potato. Once the slips are ready to plant, this is what they should look like. You want to pull these shoots out and transplant them in larger 20 gallon containers. In each 20 gallon bucket, plant 6 sweet potato slips. For sweet potato slips planting best practices, watch this video from the great Rob Bob. If you’re growing outside, you’ll want at least a 100 day long growing season to grow sweet potatoes. If you’re growing in buckets, of course, you can “extend” your growing season by starting them indoors. You never want the soil your sweet potatoes grow in to go below 50 degrees. They will morph into inedible brown mush quickly below this level. So plant them after last frost, once the soil has warmed up. Check with your local agricultural extension to find the best planting dates for sweet potatoes in your area. Sweet potatoes start off growing slowly, but shoot up like teenagers once the dog days of summer roll around. Just like any plant, make sure they stay well watered. Once your sweet potatoes have seen 4 months of growth they should be ready for harvest. In temperate climates, harvest immediately after your first frost – which is when your vines start to turn black. Here’s Rob Bob again harvesting the potatoes that you just saw go in the ground in the previous video. Many of his potatoes have started to split, likely because he left them in the ground for a full 8 months. 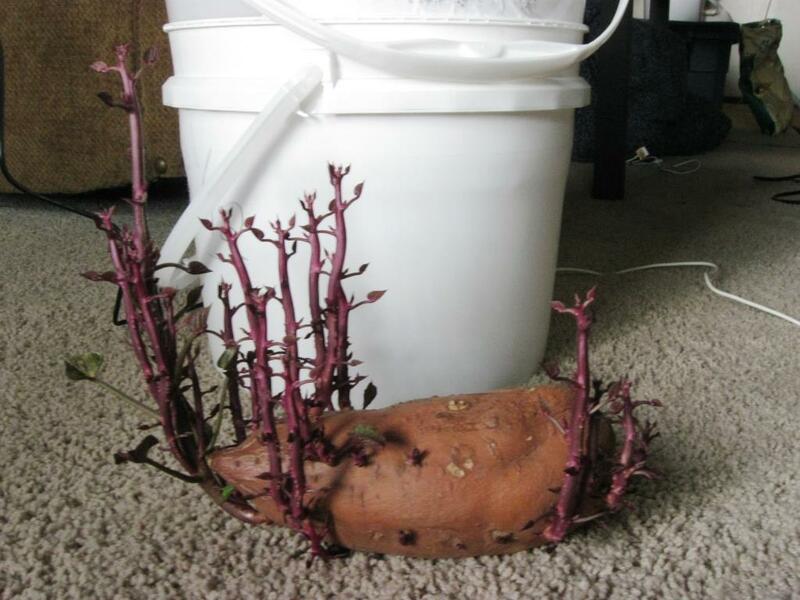 Keep sweet potatoes in a warm, humid environment for 2 weeks after harvest. Warm in this case means a toasty 80°F (27°C). This cures the sweet potatoes, encouraging them to create a protective layer of something called suberin, which protects sweet potatoes so they can be stored at room temperature for up to a year. If grown correctly, you can hope for a yield of about 25 pounds for each 20 gallon bucket sweet potato garden. That’s a very rough estimate; you may get more or less depending on variety and growing conditions. See also: our article on growing regular potatoes. enjoy the item in a bucket. i been growing in bucket in town not much room here. but every thing seem to work.love the bird house from bucket. So… who actually has a humid place over 80 degrees in their house to let these cure? I know I don’t. Any suggestions for that? You could use a heat lamp, such as one you’d use for a terrarium for lizards/amphibians, and keep a bucket of water, which will evaporate and create a humid environment. You could get an old chicken incubator. Easy to control temperature and humidity on a small scale. I use hovabators for my chick hatching. Maybe it would work? I have a indoor “greenhouse” for starting seeds. It has two plant lights in it and easily gets to 80% humidity. You could do the same with a fish tank, heat lamp, bowl of water and a sheet of plexiglas to keep the moisture in. Usually in your kitchen will be the warmest spot in your home. You could also put them on top of the refrigerator as your refrigerator puts off quite a bit of warmth. Also, if you do any baking or cooking in an oven. Next to your stove or next to a kitchen window, if you have one, would also work for the purpose of curing your potatoes. Other places could be near a living room or family room window may also work. In the garage – it stays pretty warm in there until fall. I raise chickens… you could use an old incubator / hovabator. Easy to control temp and humidity and not too expensive to operate. We put them in the back of our ford explorer, in full sun with a few pans of water. Left them for ten days and were very successful curing them, even though the temps did drop down on some nights. Average temp was 78. I have a excalibur dehydrator and since the time that I harvest sweet potatoes is also the time I am running the dehydrator pretty much nonstop, I pile the sweet potatoes on top of it and cover them with a towel. It is the end of march and some potatoes from last fall are still in perfect condition. I put them in milk crates, place them in my extra bathroom, close the door and run a small heater in the room. Once a day I run the shower to put humidity in the room. Sounds like a lot of work. Not. And worth it. I have harvest well into spring. I sprouted some on accident in the cabinet by the oven. It was sitting in a small veggie bag but the top was open so it could breathe. It was the perfect greenhouse. I live in Alaska and now I have to figure out if I can grow it in a bucket somewhere warm enough. Why not a heat rock? They are usually used to keep lizards in a terrarium. They could easily be buried in the bottom of a bucket and plugged in when needed. Water won’t hurt them. We just spread them out on the grass overnight, and the next night, gathered them up and put them away. It’s late in the year when they are harvested, and still warm, or they split! LOL! Perfect for hardening off the sweet potatoes! Do you use regular garden soil, potting mix, a combination of those, or something else? I’d like to get a good crop (of course) and have not grown sweet potatoes before. This is a great question, does anyone have an answer? This site gives some information on the soil for sweet potatoes. Sweet potatoes don’t need expensive, fancy potting soils. I’m from NC and they grow like crazy here, even in this evil red clay. If I were you, I’d just use dirt from the yard, or mix some of it with some cheap potting soil. You may want to add something to keep the soil loose so they’ll be easier to harvest, but they’re pretty hard to kill as long as you give them lots of heat. I am in Australia. Grew a huge harvest….more than in the video picture. ..from one small plant. We have awful clay soil but it grew where we used to store sand. The loved sandy soil. Gives them space to grow big. I planted my rooted sweet potatoes directly into the garden slips grew like crazy sweet potato is gone now and slips are just left..I didn’t break them off will I end up with tubers at all if I didn’t break them off and “replant” them so to speak? Thank You. We live in S.C. But, we came from Ma. Can’t wait to start this week. My first time to try growing sweet potatoes. Here is tropical so maybe it can grow better since it likes warmness. My first time to try growing sweet potatoes. I am from Sabah East Malaysia, tropical country. On the north end of the building where i think might be more sun . I live in Alberta (yes, Canada.. we don’t always have snow!). Last year we planted sweet potatoes just like regular ones, the second week in May, and by the time we took the garden off in October, we had small, (3″ round) spuds. This year, after reading, we’ve planted from slips, it was a week later, but hopefully we’ll have at least a couple of good size potatoes come. I’ll let you guys know. Thank you, not only for the information on growing sweet potatoes in containers, but also for the nutritional lesson on them. I had no idea! I am going to start mine in a south slider window. Just outside the slider is a corner of the house facing southwest, protected from wind and elements. Am going to place a seed-starting heating mat beneath the bucket on a timer so that night time temps don’t cool off the bucket overnight. (I live in the Berkshires of Western MA)I use these matts in a greenhouse when starting cuttings or seeds and they work great! Can the one potato be divided into say three or 4 individual plants and be transplanted into other buckets? much like thinning hostas? I grow my sweet potatoes in straw bales, along with the rest of my garden. Last year I decided I was tired of the tubers growing down into the soil underneath the bales. I’m planting in a straw bale this year, but will be putting that bale in a container. No soil, just conditioned straw. We’ll see how well it works. Thank you, THANK YOU, thank you! I’ve been planting sprouting sweet potatoes for a couple of years now and didn’t get anything bigger around than my thumb. Now I know what to do differently! I tried sweet potatoes several years ago. The plants were beautiful and healthy looking. When I was ready to harvest I carefully dug the ground. Oh no! No tubers. The gophers beat me. I’ll try in a bucket this time. I cut my purple sweet potatoes into 3 pieces…stuck the cut ends in water…they started rooting within 2 weeks….another week or so, they started popping slips…(the ends that were cut on both sides took longer to produce slips).I waited till the slips were about 5 to 6 inches long…popped those off and put those in water….they started rooting within 3 days…now I’m putting them in dirt in smaller pots…just bought a tub from target for 8$ to plant them in….they will decorate my patio and have food at first frost! Love growing stufff! If I could upload imagrs..I could show you why I’m sooooo excited! Thank you for this. Your post made the process easier and clearer than any other I have seen. I need to try this! I impulse bought some potato starts at a garden center the other day with no idea what to do with them! Lolol. I just couldn’t say no. Thanks for the great tips! And are they good to eat should I harvest them. Please help me. DDid you know, the leaves and vines of the sweet potato plant are also edible, tasty and nutritious? Where do you buy 20 gallon buckets? Curious where you get 20 gallon buckets? I went to Lowes, but Walmart and Target should have them. Look for those open, often blue, plastic tubs with two rope handles on them. Maybe in laundry section? Often used for children’s toys. Those are 20 Gallon buckets.